Today marks the first day of Jordan Brands “XX8 days of Flight”. The initiative is meant to build up momentum in the days leading to the Air Jordan XX8 launch. Each day JB will be unveiling a new colorway of each Air Jordan shoe themed after initial colorway of the XX8. Here we get a look at the Air Jordan 1 “XX8”, the classic AJ1 done in its OG high cut form. 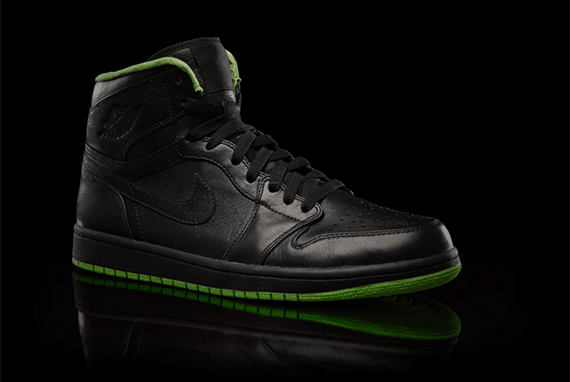 The shoe is covered in black premium leather and gets coupled with a neon green outsole and inner liner. So far this version is just a sample as evidenced by the blank tag on the tongue. How would you feel if these get scheduled for a release? Let us know what oyu think in the comments section below.